If you ask someone to name one American motorcycle it is almost inevitable they will know the name Harley-Davidson above all others. Not only because Harley-Davidson have been around since 1903, but because they’ve been a part of America’s modern history pretty much since then. Harley-Davidsons were used by American soldiers in World War 1 and World War II, they’ve been police motorcycles throughout much of America’s modern history, and they’ve been the motorcycles of choice for many Americans both the law abiding and the not so law abiding. The 15’x10′ shed in which the first Harley-Davidson motorcycles were made. 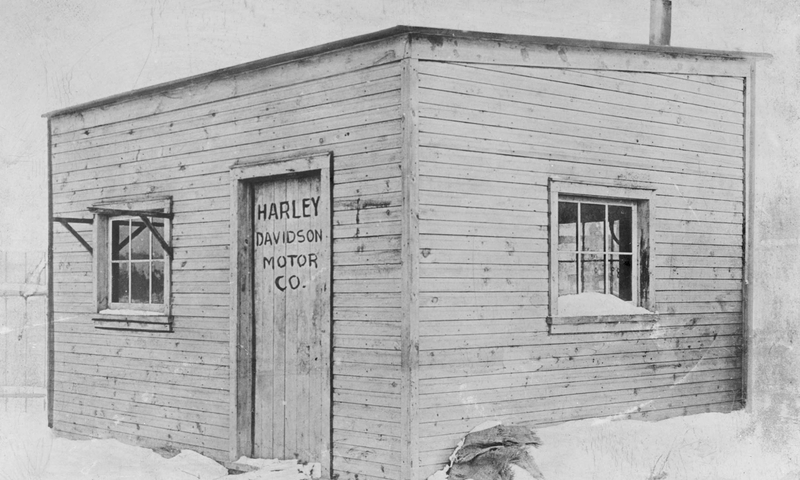 The Harley-Davidson story began in a 15’x10′ wooden shed back in 1903. That’s about half the size of a typical two car garage we enjoy nowadays. Back then a young William S. Harley got to work with a sharp pencil, a sharp mind, and some nice clean paper and drew up an engine that he planned to fit to a bicycle. Many of those reading this will likely have childhood memories of wanting to put an engine into a bicycle, or a billy cart, some succeeded and some didn’t. William Harley was one of those who succeeded. 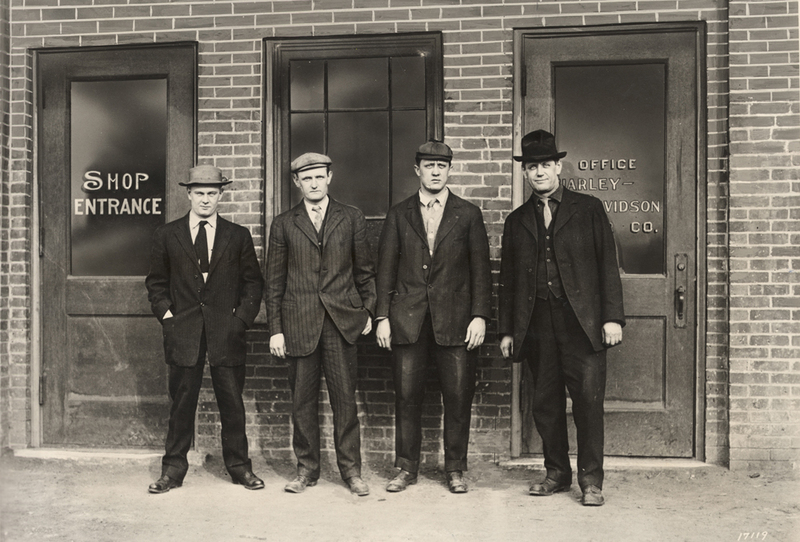 The four founders of the Harley-Davidson Motorcycle Company standing outside the second factory which was rather larger than the original 15’x10′ shed. From left Arthur Davidson, Walter Davidson, William Harley, and William Davidson. (Photo courtesy the HD Archives). 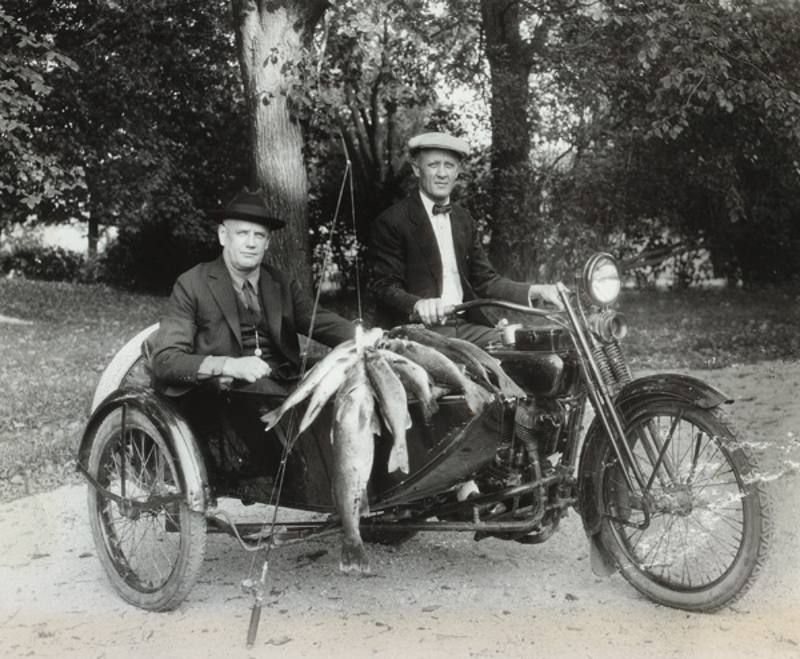 William Harley had a friend named Arthur Davidson who was a keen fisherman. Likely one of those guys who would nowadays have a sign on the back of his four wheel drive that says something like “Wife thinks I’m working, boss thinks I’m sick, time to go fishing“. Arthur’s interest in William’s project to put an engine into a bicycle was simply that it would be a device that would save a lot of walking to get to good fishing spots. He wanted one. In fact his brother Walter Davidson years later in 1919 said “The business had its origin, not through any particular idea on the part of the starters of it that there was a commercial future for the motorcycle, but through the desire to make a motorcycle for our personal use“. Why was the Harley-Davidson invented? This picture pretty much sums it up. (Picture courtesy motorcyclemuseum.org). William Harley, and Arthur and Walter Davidson got involved in building motorized bicycles with a first prototype built around 1901. William Harley and Arthur Davidson had been working in a bicycle factory up until around that time which had helped equip them with the skills for their experimental efforts. However William Harley wanted to go to college and he enrolled at the University of Wisconsin to study engineering. He worked as a waiter to support himself and also worked part time as a draftsman to get through his studies. He graduated in 1907 but during this time he teamed up with Arthur, Walter and William Davidson to make motorcycles including motorcycles for racing. In 1904 they had a practical road going motorcycle and on 4th September 1904 the boys motorcycle ridden by a man named Edward Hildebrand competed in the Milwaukee Motorcycle Race where they came in fourth. The Harley-Davidson motorcycles of this time were typically 440cc machines with the engine developing around 4hp. 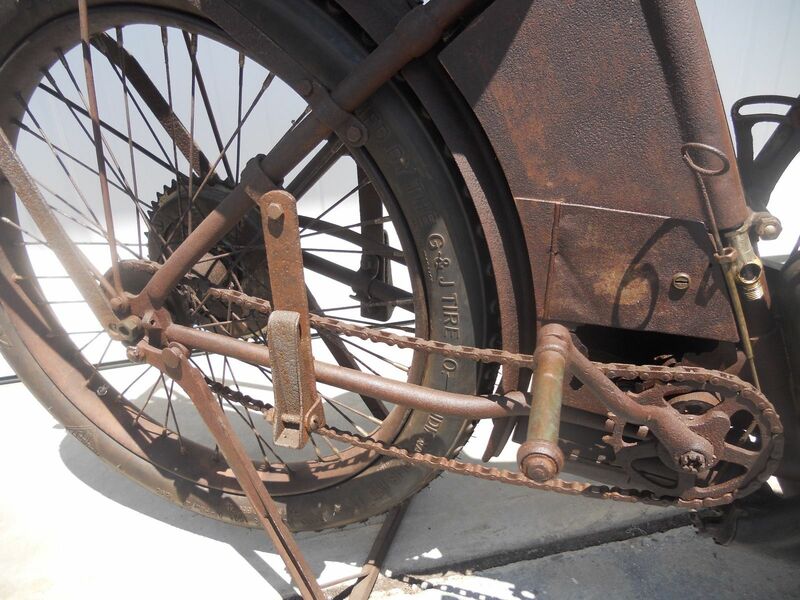 The engineering of early Harley-Davidson motorcycles clearly shows their bicycle origins. In 1905 the four friends began to make do it yourself kits for people who wanted to build their own motorcycle. During 1905 production of complete motorcycles was begun and Carl H. Lang of Chicago was the first to sell complete Harley-Davidson motorcycles. In 1906 the Harley-Davidson team built a new factory in what was then called Chestnut Street but would later be re-named Juneau Avenue. This was the first proper factory and Harley-Davidson have remained there ever since. The pedals qualify this early Harley-Davidson as a “moped”. With William Harley’s graduation in 1907 he had the time to really invest into turning this company from the small concern it had been into something that would be a real business. The factory was expanded and was soon producing around 150 motorcycles per year and growing. In 1907 William Harley was already putting his engineering degree to work and he designed the first Harley-Davidson V twin engine. It was basically the old 440cc single doubled in size by having another 440cc cylinder attached to it. This 880cc engine pretty much doubled the power of the engine so it was putting out 7hp. These bikes were not immediately produced in numbers however, but the prototype was shown at the Chicago Motor Show. In 1908 Harley-Davidson made 450 motorcycles and the following year 1909 1,149 were made. This gives an idea of just how rapidly the business was expanding and indeed the factory would be expanded in 1913 to meet the demand. In 1911 the improved 811cc Harley-Davidson V twin was introduced. This is the engine of the bike in our pictures. In 1911 the V twin engine was improved with a reduction in capacity to 811cc but an increase in power. The new engine had mechanically operated intake valves (see picture above). This then became the company’s main model. 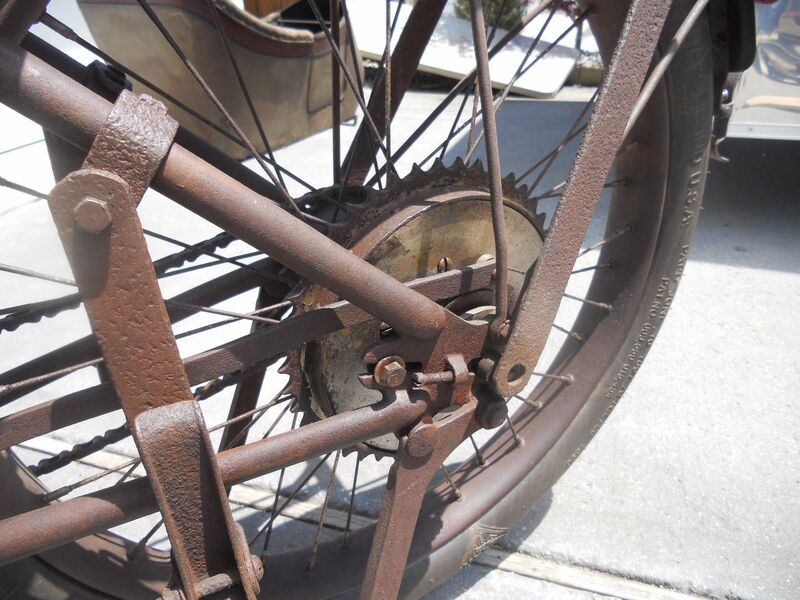 The bike also gained a sprung suspension saddle in 1912. Harley-Davidson called this the “Full Floating Seat”. By this time the company was selling motorcycles to police departments. 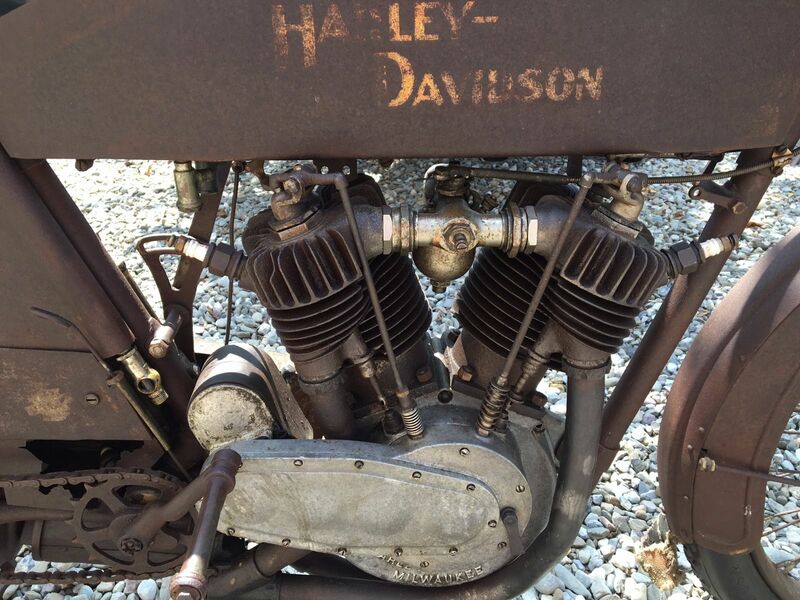 1913 Harley-Davidson V twin with the 811cc engine and the adjustable Fully Floating Seat up for sale on eBay. On the race track the Harley-Davidsons were becoming the force to be reckoned with and by 1914 production in the new factory had reached 16,284 motorcycles. However over in Europe 1914 was the year that Gavrillo Princip was afforded the opportunity to assassinate the Archduke Ferdinand of Austria and his wife in Sarajevo setting in motion the chain of events that would begin the First World War that same year. For Harley-Davidson this would mean that production would be turned over to producing motorcycles for the war effort. Some 15,000 were made for the US Army which would have been a large proportion of annual production. This 1913 Harley-Davidson V twin would be typical of police, army and civilian Harleys of the period. 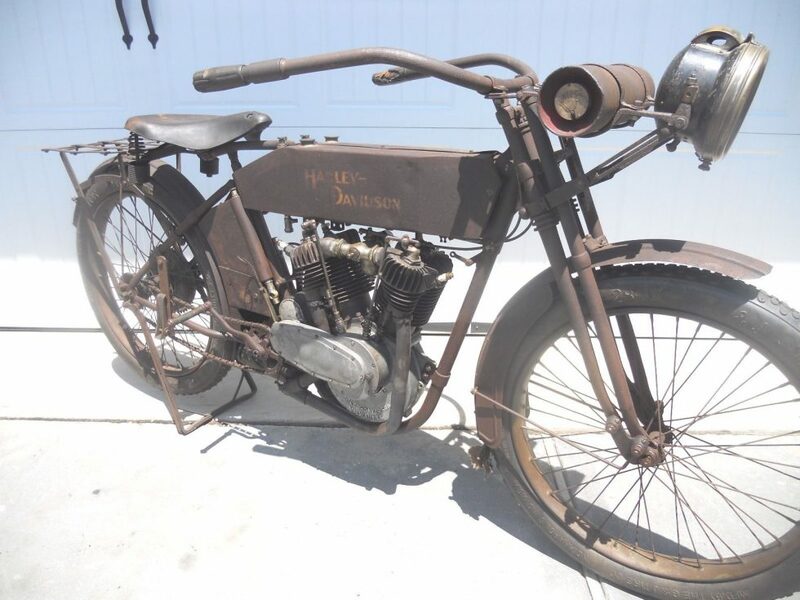 The vintage 1913 Harley-Davidson motorcycle in our pictures is currently for sale on eBay and you will find that sale page if you click here. This bike also features on Barnfinds.com and you’ll find that page if you click here. In its current original Iowa farm barn find condition the bike is only suitable for static display and preservation. 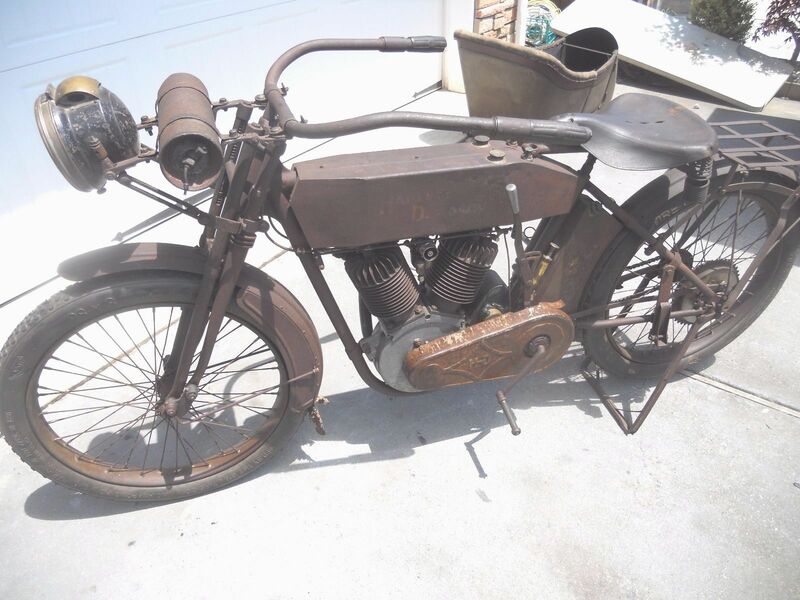 If a buyer intends to ride the bike then a complete restoration will be required which will include a complete engine strip down as it does not turn at present. 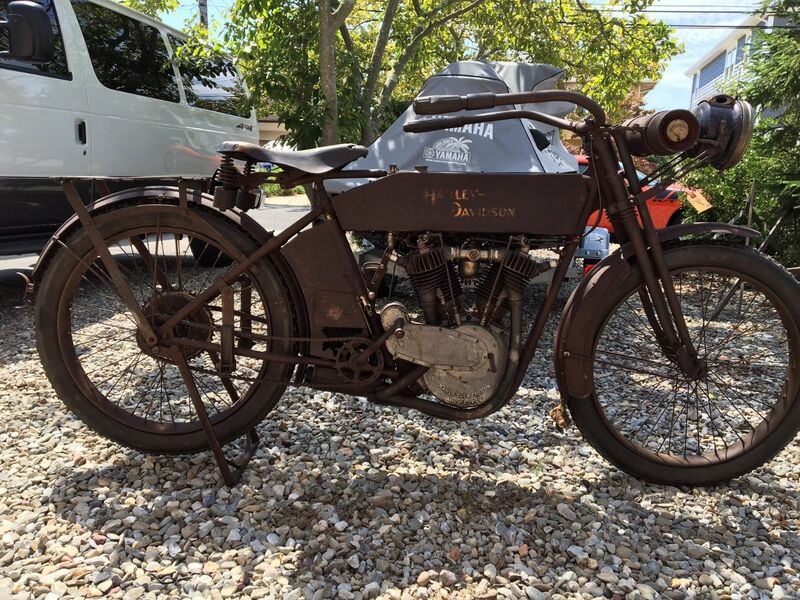 This is an unusual and very historic Harley-Davidson motorcycle. This is an example of the bike that created the legend. Harley-Davidson’s went to war in 1917 with the US Army. 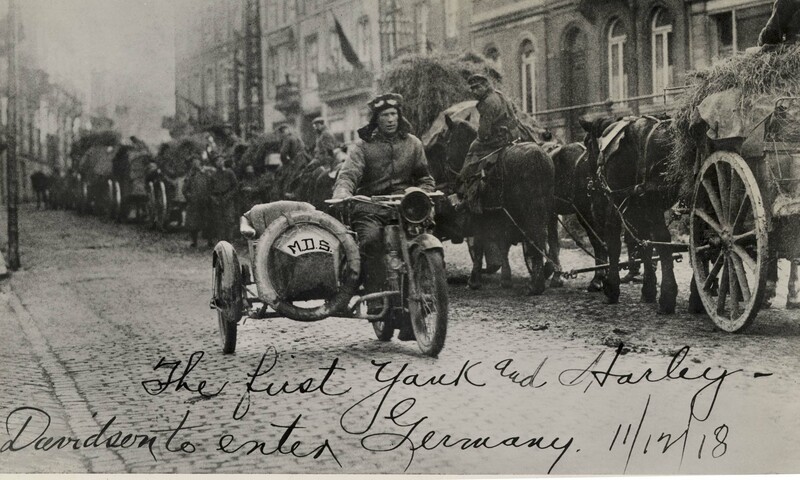 This picture is of the first Harley-Davidson to enter Germany during that conflict. (Picture courtesy visordown.com).